"In France, it's the Eiffel Tower. In India, it's the Taj Mahal. In Las Vegas, it's the Landmark." The strange case of the Landmark Hotel & Casino began in the planning stages when it was originally conceived to be 14 stories tall. Construction began in September of 1961, but it wasn't long before the scope of work increased to 20 stories with completion set for the spring of 1963. Inspired by the Space Needle design in Seattle, the project grew in scope yet again the following year adding an 11 additional stories. 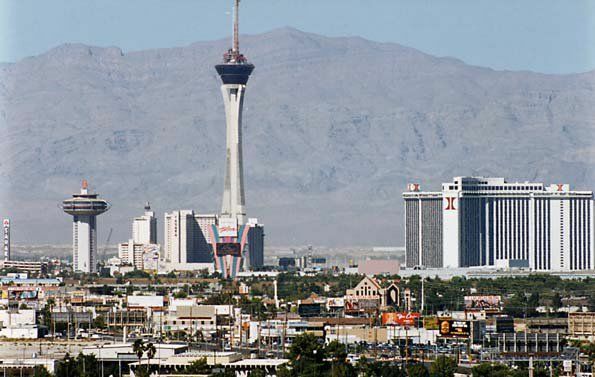 This was to surpass the Mint's planned tower and, at 31 total stories, it would become the tallest building in Nevada. Plagued by financing woes that delayed construction, it wasn't until Howard Hughes bought the property in the late 1960's for $17 Million, financing another $3 million of his own money that the hotel was completed. Finally opening on July 1, 1969, The Landmark was already cast in the shadow of the first mega-resort in Las Vegas, The International (now Westgate), which cost an estimated $60 million in comparison. 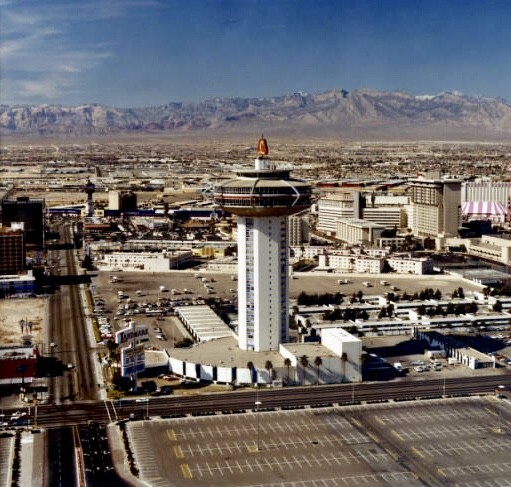 Once the largest building in Nevada, The Landmark was dwarfed by the still-under-construction-as-of-1996 Stratosphere. While The Landmark was certainly a sight for its time, its impractical design, continual development of mega-resorts and numerous changes in ownership proved to be its downfall as it never became a success. By the late 1970's, the hotel had already lost $15 Million and continued to lose at a rate of $3 Million yearly through the 1980's. With a limited number of rooms, plans to expand The Landmark to compete with the mega resorts fell through in 1980's leaving the hotel to close for good in 1990. The Las Vegas Convention and Visitors Authority Purchased the property in 1993, later demolishing the resort in November of 1995 to build - you guessed it - a parking lot. Construction Dates: September, 1961 - Past its opening as some maintenance systems were never installed. Location: Technically, The Landmark was located in Paradise, NV at 364 Convention Center Drive. Costs To Build: Including the purchase price by Howard Hughes and the $3 Million invested to complete construction, $20.3 Million. Number of Rooms: When it opened, The Landmark had a total of 503 rooms. Over the course of its existence, the room totals would fluctuate from 503 to 524 in 1977, to 498 upon its closing in 1990. Plans to expand the hotel's capacity to 1500 with additional towers fell through in the 1980's. Number of Floors: Originally planned for 14 stories, The Landmark was built with a total of 31 floors to top The Mint's plan, making it the largest building in Nevada for a short period of time. Closing Date: The Landmark closed its doors for good on August 8, 1990. Demolition Date & Time: November 7, 1995 at 5:37am. In 1962, The Los Angeles Times called the $6 Million project, "By far the most spectacular project" out of several Las Vegas resorts that were under construction. In 1969, a person attempted suicide by flying a stolen Cessna 180 plane toward the Landmark tower, pulling up just before hitting it. The plane brushed the top of the tower before crashing into the Las Vegas Convention Center across the street, killing only the pilot. After Howard Hughes purchased the property, the building's blueprints were destroyed. Demolition crews found secret stairwells in the structure. The tower was actually comprised of five separate structures, each capable of standing alone. They included four pie-shaped towers and an elevator shaft running up the middle. The 31-story tower was the tallest reinforced concrete building ever demolished in North America, and the second tallest building in the world to be demolished. Fireworks at the base of The Landmark prior to its demolition were used to simulate an attack for the film "Mars Attack."